Clockwise from top-left : Mel, Mick, Derek, Charlie and Jim. Lacking the power required of their drummer, Mike Ogletree was asked to leave the band when the New Gold Tour paused briefly before the UK dates in November 1982. His successor was already well known to the band: Mel Gaynor had stood in during the recording of New Gold Dream (81,82,83,84). Mel's drumming power certainly helped propel the band towards the changing, harder sound of Sparkle In The Rain. 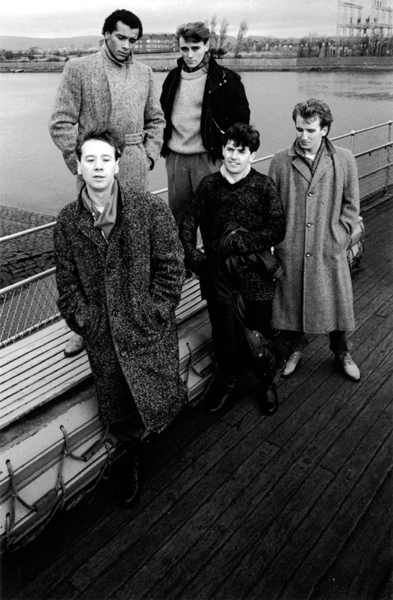 After the Tour Du Monde and celebratory Barrowlands concerts of 1985, most of the band were camped at Barwell Court, working on ideas for their new album. Relations in the band were not 100%: Derek had rowed with Jim over the amount of screen time alloted to each band member in the Don't You (Forget About Me) video, and had also attracted tabloid attention after a public row with his girlfried. However, he sealed his fate when he stopped turning up for rehearsals at Barwell Court. Derek was expecting his dismissal when he was summoned to Bruce Findlay's office and took it on the chin. After thinking of a solo carrer, he later joined Propaganda and was reunited with Brian McGee who became the group's drummer.